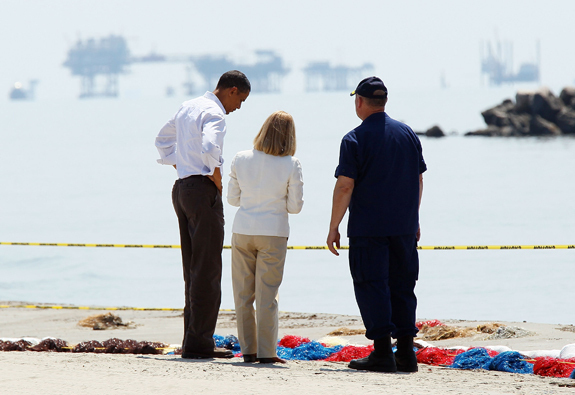 The cover of The Economist shows President Barack Obama alone on a Louisiana beach examining the aftermath of the BP oil spill in the Gulf of Mexico. Under the headline “Obama v BP,” the president appears to be contemplating how to handle the political and ecological disaster. In the original photo, President Obama is standing next to Admiral Thad W. Allen of the Coast Guard and local parish president Charlotte Randolph. In July 2010, The New York Times Media Decoder blog revealed that Ms. Randolph was digitally removed and Admiral Allen was cropped from of the cover.